In the Netherlands, A6 motorway and A7 motorway used to cross near Joure using a roundabout until October 2017, when the junction was turned into a full Y-interchange. The junction between the A200 and the A9 uses a 3-level stacked roundabout. Near Eindhoven (the Leenderheide junction), the junction for the A2 uses a roundabout. An overpass was built for the A67 from Antwerp to Germany. ^ "Was alles in Görlitz erfunden wurde - Alles-Lausitz.de". Alles-Lausitz.de (in German). Retrieved 5 June 2017. ^ Tom Geoghegan (1 July 2011). 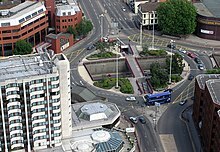 "Is the British roundabout conquering the US?". BBC website. Retrieved 1 July 2011. ^ Commonwealth of Massachusetts, Registry of Motor Vehicles. "Sharing the Road: A User's Manual for Public Ways". Retrieved 13 May 2009. ^ Shashi S. Nambisan, Venu Parimi (March 2007). "A Comparative Evaluation of the Safety Performance of Roundabouts and Traditional Intersection Controls". Institute of Transportation Engineers. Retrieved 27 November 2007. ^ a b Vos, Christiaan (31 January 2016). 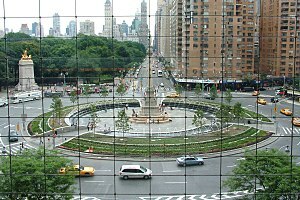 "Effecten realisatie turborotonde onderzocht" [Effects research of turbo roundabouts]. Verkeer - Verkeersveiligheid - Vorm (Traffic, Safety, Form) (in Dutch). Dirk de Baan. Archived from the original on 28 January 2017. Retrieved 28 January 2017. This page was last edited on 21 April 2019, at 00:09 (UTC).